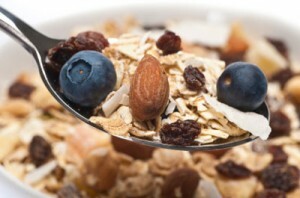 This is a healthy version of granola, which is normally laden with carbs and bad fats. Warm spiced nuts, plump sweet blueberries, and coconut cream are a delectable combination and make a fabulous breakfast. 4. Serve warm in bowls, topped with blueberries and cream.